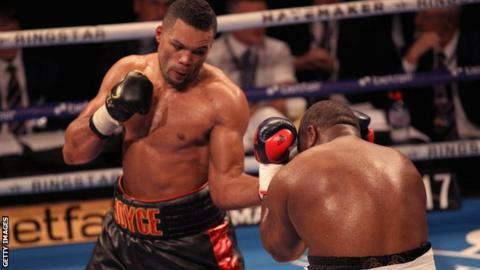 British heavyweight Joe Joyce began his professional career by stopping Ian Lewison at London's O2 Arena. The 32-year-old, a silver medallist at the 2016 Rio Olympics, won with 25 seconds remaining in the eighth round. Joyce showed his superiority but, despite Lewison being hampered by a swollen eye, did not appear to be pursuing the stoppage. After Lewison slipped to the canvas, he was pushed back to the ropes and his trainer threw in the towel. "Joe's got stuff to work with; he got caught with some big right hooks," said promoter David Haye. "He was a little bit reckless in the first couple of rounds and I was a little worried early when he was mixing it unnecessarily but I know he's got a good chin."